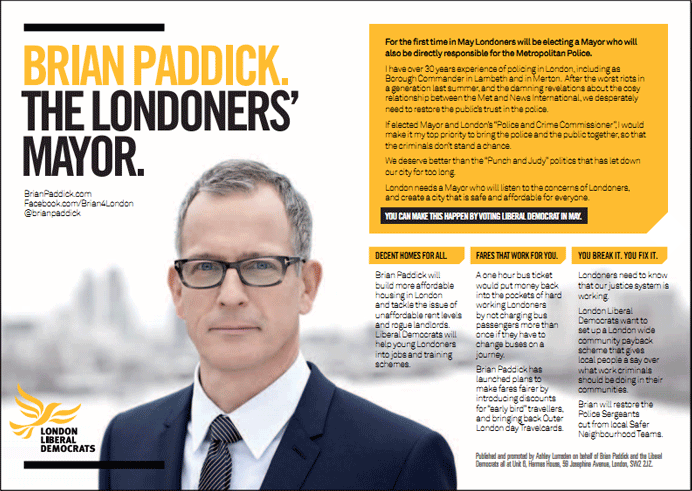 I’ve been taking quite an interest in next month’s upcoming London Mayoral Elections. I threw together a webapp a couple of weekends ago to see how people in a specific London postcode area voted. Today I got home to find an election leaflet through my door, promoting the election itself and highlighting the manifestos of the Mayoral candidates. 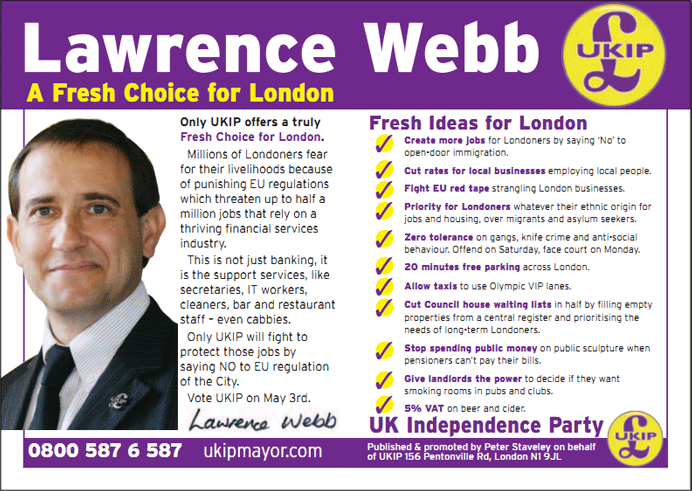 It’s available online at the London Elects website. In this post I’m going to deconstruct the seven Mayoral manifestos and their highlights (or lowlights). Webb won the dubious honour of being first in the booklet, as the introduction text explains: “I drew lots to decide the order they appear in this booklet”, says Returning Officer John Bennett. All of the candidates contributed £10,000 to production costs, which is pretty staggering in itself. Webb’s manifesto makes the fairly bold design decision to bleed the candidate’s image right off the edge of the page, looking initially like a printing error. I had no idea the UKIP logo was a pound sign, and at a glance it looks like Webb’s campaigning to open a new cut-price supermarket. Policies aren’t much better: third on the list is the vague-sounding “Fight EU red tape” (what does that actually entail? ), and the “20 minutes free parking across London” sounds impossible to enforce. He has a quick stab at art, promising to “stop spending public money on public sculpture”, as though millions of pensioners are freezing to death as a direct result of Anthony Gormley. Finally, he throws in a few populist, laughable promises: allowing landlords to somehow circumvent British law and allow smoking in pubs, and decreasing VAT on beer and cider by 15 percentage points. If you hate immigrants and like booze, he’s your man. This one is incredible. Of all seven of the manifestos, this one has the least-prominent display of the candidate’s name. 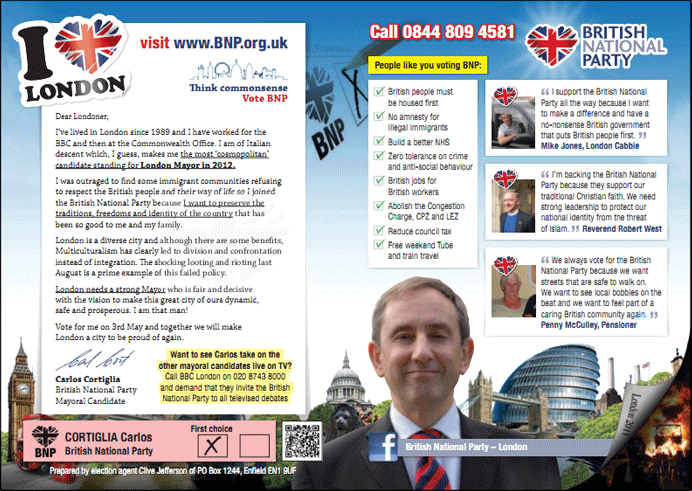 Could it be because the British National Party’s candidate is in fact an Italian? Amazing. Also, how much text is there on display here?! It looks like a website or something compared to everyone else’s 5-point pitches. One of his policies is “Free weekend Tube and train travel”, with no hint of how this could possibly be paid for. I guess once we kick out all of those illegal immigrants demanding amnesty and presumably scrounging benefits, we’ll all be rolling in it, eh Carlos? 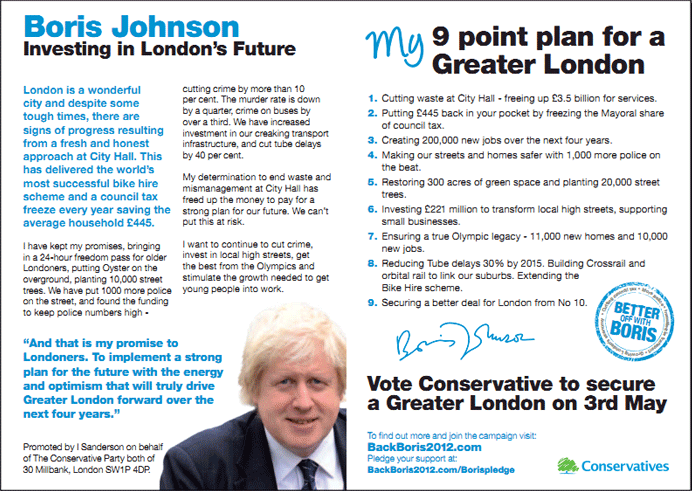 He also throws in the promise to “reduce council tax” (how?) and “abolish the Congestion Charge” (along with some mysterious acronyms). The BNP, like the Lib Dems before them, have the magical power to invent pretty much any fairytale policy they want, without the discomfort of having to, you know, explain how on earth this could be implemented. I don’t have the patience to spend hours looking up possible racists, but in the past the BNP have been exposed for using stock photography models as examples of “real” BNP voters. This time they roll out a taxi driver, a pensioner, and a Guardian reader-esque vicar, all spouting on about British people, “bobbies on the beat” (why does this phrase always persist?) and the inevitable “threat of Islam”. The best detail of the whole thing almost escaped me as I got lost in the reams of text. Nestled in the corner under an Apple-esque faux page curl is an image of London on fire. I can’t decide if this is Enoch Powell-aping “rivers of blood” stuff, or just a ridiculous effort at dramatising their chances of actually achieving, well, anything, given their laughably legless “policies”. 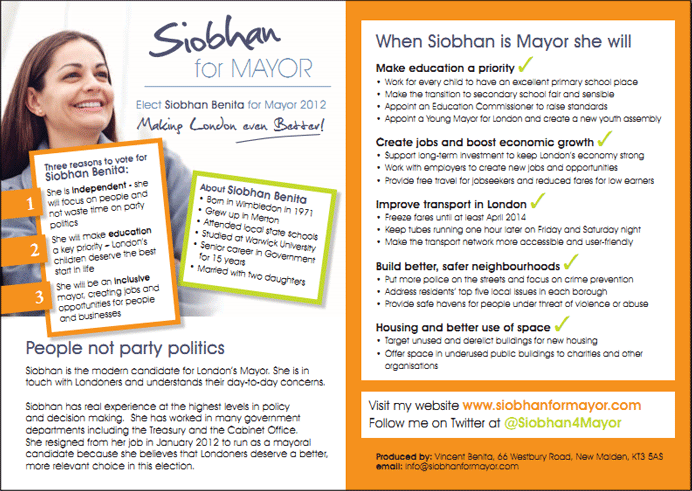 Siobhan is the token independent and is attracting lots of Twitter attention for her “no party politics” stance. Most of her policies are aimed at the Mumsnet bloc and she also has a few partygoer-friendly efforts (“keep tubes running one hour later on Friday and Saturday night”). 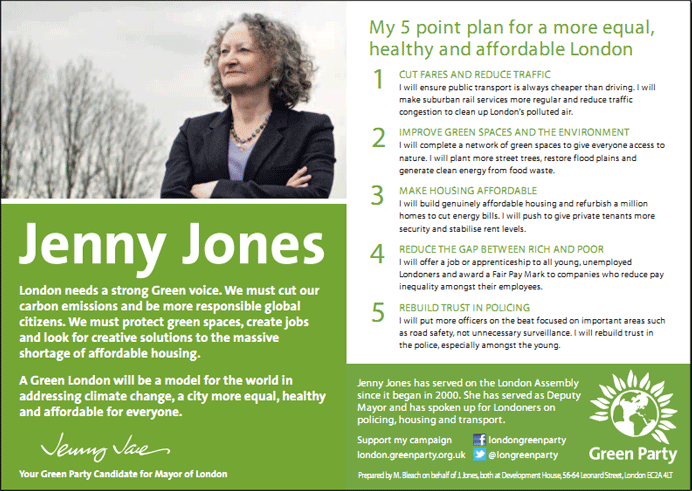 She also has some quite novel policy ideas: “Address residents’ top five local issues in each borough”. I like that she hasn’t bothered to find out what some of these issues are, but promises to address them anyway. If locals clubbed together and voted up their issues to include things like “free zoos at each tube station”, would she address them? She also takes a leaf from the BNP’s book in terms of producing policies without any actual attempt at explaining how they work: “work with employers to create new jobs and opportunities”. Ah, that’s clear then. The unemployment rate will be right down in no time under Siobhan. It has to be said: this is the most well-designed of the seven candidates’ manifestos. It looks great, gets his name and image across quickly, and incorporates the party colours in a way that’s not brash and cartoonish. He also wins some points with me for highlighting the annoyance of having to pay for a second bus journey when the one you’re on breaks down or inexplicably stops mid-journey. That said, though, he has a hard job solely for attaching his name to the hated Lib Dem cause. There’s no stand-out point on the poster since it’s pretty text heavy, although he’s clearly going for the policing angle in the main box-off. I quite like the sound of his “community payback” scheme, which to me sounds as though it will see criminals locked in the stocks as hard-eyed pensioners throw sponges soaked in piss at them. In reality it will probably just be a boring Neighbourhood Watch-esque scheme where offenders end up weeding the garden of the person whose DVD player they jacked, but a man can dream. Ah, Boris. I expected more, to be honest. I thought there’d be shots of him on his bike surreptitiously checking a fit girl’s arse, or maybe those promo shots of him with a broom after the riots. This is pretty toned down and minimalist, and looks downright bizarre in the shot above where the page fold has resulted in Boris being brutally cropped at the shoulder. Beginning his quote with “and” gives it a kind of Shakespearean grandeur, doubtless the kind of effect the Old Etonian desired, but coupled with the faintly sinister “the murder rate is down by a quarter”, everything’s mixed up. It’s funny, you never really hear the man on the street praising his candidate of choice for sorting the murder rate out. Typographically, Boris has committed one of the worst typesetting sins imaginable as he leaves not only an orphaned sentence at the end of the first column, but he leaves it hanging with a hyphen. FLOATING IN NOTHINGNESS. It made me wince to read. The first two points of his plan seem to criticise his own work: reducing “waste at City Hall” (what, it took you four years to spot it?) and “freezing the Mayoral share of council tax”, phrasing that made me imagine Boris sitting on a throne eating grapes as I slavishly pay my monthly stipend. Reminding your voters of the bad things your office represents as your opening gambit seems a bad move to me. It must be really easy being a graphic designer for the Green Party. Colour palette problem? Why not go for green! Struggling to decide what shade to use to illustrate your environmental credentials? How about green! Not a fan of South America? Simply butcher it into an unrecognisable blob in your party logo! But I digress. Her promise of a “Fair Pay Mark” to companies willing to reduce pay inequality strikes me as the kind of thing a primary school teacher might offer to pupils to tempt them into doing their sums early. She almost but not quite manages to play the “bobbies on the beat” card and, to her credit, acknowledges the lack of trust in the police by young people. Finally, I was bemused for a moment by their Twitter handle, which looks at first glance like “long green party”. Last and probably least, Ken. 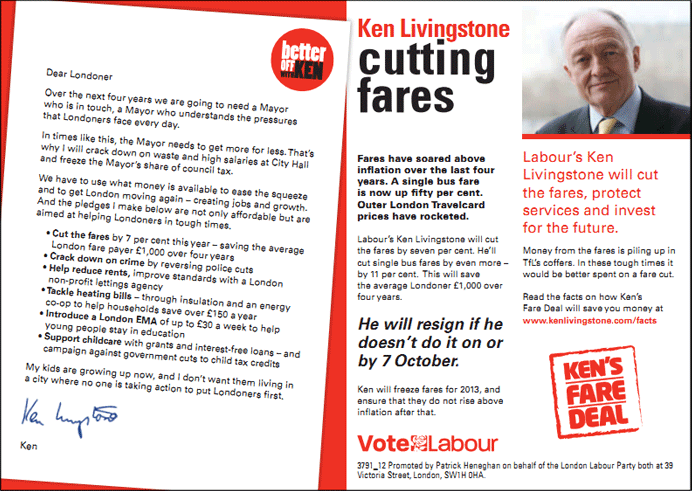 Incredibly, he uses the same slogan as Boris: “Better off with Ken” (versus Boris’s much more alliteratively-pleasing “Better off with Boris”). Ken’s letter is as brash as its author, beginning with the irritated-sounding “Dear Londoner” which only comes across as grudging. Ken later admits as much when he acknowledges that he’s only really in it for his kids; the rest of us are just lucky enough to live in the same city as them. To be fair, he does a good job of mostly backing up his policies with outlines of how he’d implement them, and his promise to quit if he doesn’t achieve the tube fare decrease is quite interesting. Design-wise it’s as minimalist as Boris’s, not doing much to dispell the suggestion that they’re essentially preaching the same things but from the other end of the spectrum. So what have we learned? UKIP are chancers just having a laugh; the BNP have a keen eye for a Photoshop opportunity; Siobhan Benita should probably just become a teacher; Brian Paddick might stand a good chance of becoming a golfwear model; Boris doesn’t have a left shoulder; Jenny Jones can wither trees with her steely gaze, and Ken could probably knock you out in a fight. I still don’t know who I’m voting for.